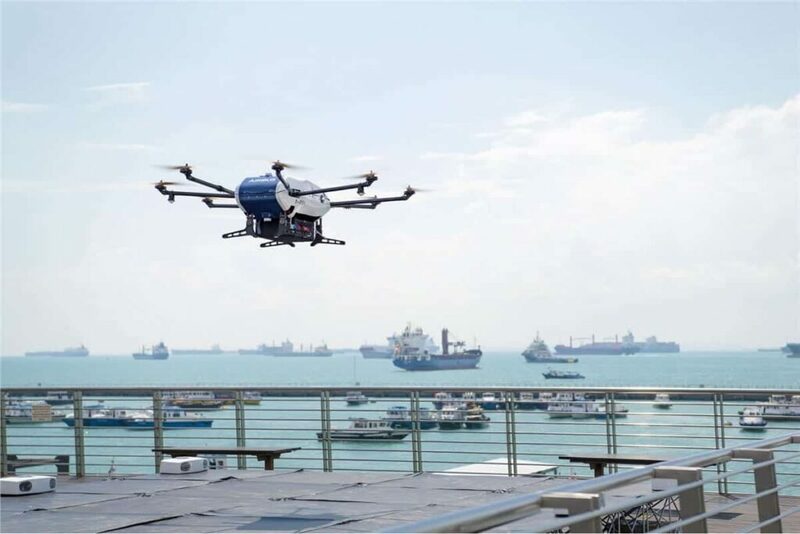 Airbus has announced that it has begun shore-to-ship trials in Singapore with its Skyways parcel delivery drone. This marks the first time that UAS (unmanned aerial system) technology has been deployed in real port conditions, to deliver a variety of small, time-critical maritime essentials to working vessels at anchorage. The maiden shore-to-ship delivery flight was made to the Swire Pacific Offshore’s Anchor Handling Tug Supply vessel ‘M/V Pacific Centurion’, 1.5km from the shoreline of Singapore’s Marina South Pier, carrying 1.5kg of 3D printed consumables. Landing safely on the ship deck and depositing its cargo to the shipmaster, the Skyways unmanned air vehicle swiftly returned to its base, with the entire flight taking place within ten minutes. The trials are being undertaken in conjunction with partner Wilhelmsen Ships Services, a maritime logistics and port services company. During the trials, Airbus’ Skyways drone will lift off from the pier with a payload capability of up to 4kg, and navigate autonomously along pre-determined ‘aerial corridors’ to vessels as far as 3km from the coast. Airbus and Wilhelmsen Ships Services signed an agreement to drive the development of an end-to-end unmanned aircraft system for safe shore-to-ship deliveries. The collaboration marries Airbus’ extensive expertise in aeronautical vertical lift solutions and Wilhelmsen’s wealth of experience in ship agency services. A landing platform and control centre were set up at the Marina South Pier in November 2018, through the facilitation of the Maritime and Port Authority of Singapore. The maritime agency also designated anchorages for vessels to anchor off the pier for the trials, while the Civil Aviation Authority of Singapore worked with Airbus and Wilhelmsen to ensure safety of the trials.